A close-up of the common cold virus. Watch for "Health Minute" on HLN, 10 a.m.-6 p.m. ET weekdays. (CNN) -- A cure for the common cold has eluded scientists since the dawn of mankind. Common colds -- also known as human rhinovirus -- affect billions of people worldwide every year and have more than 100 different, but related, strains. Each of these strains can cause a variety of symptoms in sufferers. Doctors say that variety is what makes the common cold so hard to understand and so hard to treat. 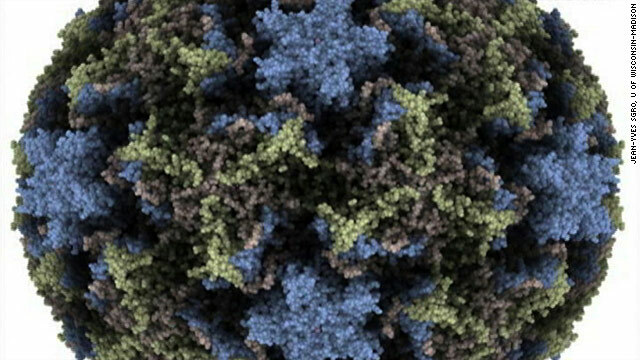 Last year, researchers from the University of Maryland and the University of Wisconsin-Madison announced that they had taken the first step in finding a cure for rhinovirus by mapping each strain's entire genome. Now, those same scientists have found some interesting things about all those different strains. "We continue to see a new virus that appears to come from two viruses," said Dr. Stephen B. Liggett, co-leader of the project and a professor of medicine and physiology at the University of Maryland School of Medicine. "So a person can become infected with two viruses, and a third unique virus is formed." Why those mutations develop is still a major question, but Liggett says most of them don't cause any harm. "It's really more about why they develop ... because many are not very strong, but in some cases, they are," he said. "So we need to better understand them." A person can become infected with two viruses, and a third unique virus is formed. When the different strains of the common cold were mapped early last year, researchers were looking for ways to develop diagnostic tests and eventually possible treatments. Since the completion of the mapping, researchers have been working on a diagnostic test for the virus. Originally, the test was expected to cost about $2,000, but they have perfected the technique and found they can develop a much cheaper test for about $20. That means a test for the cold may one day be common in doctors' offices. A fast and inexpensive test is good news for asthmatics and people who have chronic obstructive pulmonary disease, for whom colds can be life-threatening. "Fifty percent of the exacerbations that occur in patients who have these two diseases are due to a rhinovirus infection," Liggett notes. "So it's that group of people we are targeting. Those would be the first group we'd like to help." Respiratory infections including colds and the flu are some of the most common causes of asthma flare-ups, especially in young children, according to the American Asthma Foundation. Although the genetic mapping of the different strains is a positive step, many in the medical community say the virus itself is just too complex to tackle. But Liggett ignores the naysayers; he says that by mapping the genome of the different strains and assembling the results into a "family tree," scientists can better understand how virus strains are related, as well as their differences. Last year, researchers found that human rhinovirus strains are organized into about 15 subgroups, so a "one-drug-fits-all" approach to treat the cold probably won't work. But Liggett says he and his fellow researchers hope to streamline those 15 subgroups into five, which would make it easier to treat the virus. "Better to have five treatments than 15," Liggett said. "Right now, vaccines and other treatments aren't our main goal," Liggett said. "Hopefully, we will be able to design treatments some day. Taking our research little by little will help us understand a virus we've never been able to figure out before. And for now, that's what's most important."